When the DANA began rolling off Czechoslovakian assembly lines in the late 1970s, there wasn’t much else like it. The enormous, 152-millimeter self-propelled howitzer had eight road wheels instead of tracks. Most mobile artillery pieces at that time were tracked, like tanks, and the DANA was the first gun its of its size to roll on wheels — while carrying an innovative auto-reloading mechanism for the cannon. The Czechoslovak People’s Army wanted the DANA so it wouldn’t have to rely as much on the Soviet industry for its needs — and the wheels made for a speedy and rapidly-deployable artillery piece, the most significant downside being less off-road maneuverability. It worked well enough. The self-propelled gun is now battle-tested, with more than 670 built in total and exports to Poland, Libya and the Soviet Union — which were handed down to the successor states of Georgia and Azerbaijan, which still have them in service. Most recently, the Czech military used them in Afghanistan. The DANA is more precisely a Slovak weapon. In the 1990s, the recently-independent Slovakia — with its DANA-producing factories — produced the Zuzana, a successor to the Dana which is similar except for its 155-millimeter cannon designed to accommodate standard NATO ammunition. The only other country to ever adopt Zuzana is the Republic of Cyprus. Now the Slovak company Konstrukta has a very interesting successor to the DANA and Zuzana known as the Zuzana 2. On May 23, 2018, the Slovak army announced it would be the first to acquire 25 Zuzana 2s, which have been in testing since 2014. The machine is enormous at more than 46 feet long — and rather unique looking. It looks like construction equipment, and it is quite heavy at 37.5 tons, which is 10 tons heavier than the U.S. Army’s self-propelled, tracked M-109 Paladin howitzer. Befitting the wheeled configuration and using the M-109 as a comparison, the Zuzana 2 can travel 15 miles faster — at 50 miles per hour — and has 156 more miles of unserviced range at 372 miles in total. 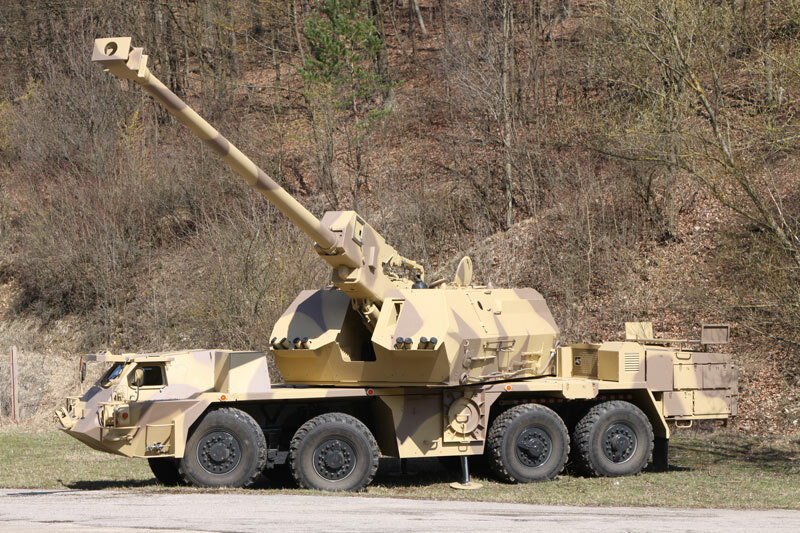 Like the first Zuzuana, the Zuzana 2 has a 155-millimeter howitzer servicing NATO ammunition. The crew has been reduced to three, from the Zuzana 1’s four, due to increased automation. The reason this machine is appearing now has to do with Slovakia’s goal of equipping a modern mechanized brigade with an artillery battalion that can respond rapidly to crises — whether affecting Slovakia itself or the NATO alliance, which is all the more salient given Slovakia’s proximity to Ukraine. The Slovak armored corps is still largely comprised of Warsaw Pact-era T-72s and BMP-1 and -2 armored fighting vehicles, although Slovakia is acquiring dozens of Finnish Patria armored vehicles to replace the BMPs. The most important upgrade to the Zuzana 2 is its “MRSI” capability — or multiple-round simultaneous impact — where the fire-control computer crunches the numbers for multiple rounds to fire at different trajectories in short succession, causing each high-explosive shell to land in the same place at the same time. This makes the Zuzana 2 one of the most advanced artillery systems in the world.